- Buy land now! 40,000 people are moving to Inner Banks location! - World Class sized redfish being caught in Neuse River right now! Current Prices Exceed Future Projections? Early fall and winter along the inner banks region traditionally shows a spike in real estate sales. The lazy, crazy, hazy days of summer are over and folks tend to get out and get serious about buying real estate. 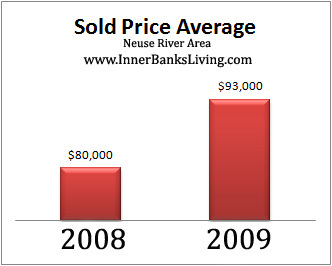 The chart above shows the average sold price for lot/land in the Neuse River area. (Information was derived from the Neuse River Realtor’s Association MLS). 2008 average of $80K is an average of all sold properties in Septemeber, October and November. The 2009 average sold price of $93K is from August to mid-September when this newsletter was published. All indications show that as we head on into one of the most active sales periods for the inner banks, prices are 14% higher than the year before. A sign of recovery? My opinion is that it is a sign of very choice properties are currently being bought by those who understand the market place. The opportunity is great right now. Bankrate.com researchers gathered closing-cost information from at least four lenders in 50 states and the District of Columbia. In California, researchers also collected data separately for Los Angeles and San Francisco. Researchers requested a good faith estimate for a $200,000 loan, assuming a 20 percent down payment and good credit. North Carolina had the 46th lowest closing costs out of 52 states, districts and cities surveyed. McLean, VA – Freddie Mac (NYSE:FRE) today released the results of its Primary Mortgage Market Survey® (PMMS®) in which the 30-year fixed-rate mortgage (FRM) averaged 5.07 percent with an average 0.7 point for the week ending September 10, 2009, down from last week when it averaged 5.08 percent. Last year at this time, the 30-year FRM averaged 5.93 percent. Photo taken aboard Down East Guide Service with Captain George Beckwith. 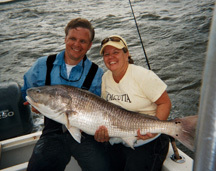 World class size red drum come into the Pamlico Sound and the Neuse River this time of year to spawn. These large drum are strictly a catch and release fishery. It is not uncommon for Captain George Beckwith to catch and release 4, 6, 8 or more of these fish in a single trip! These monster red drum, sometimes called drum or redfish-Can weigh 20, 30, 40, 50 lbs. or more! Greg West, chief of staff for H&H, says enough homes will be available when as many as 40,000 people move to the area because of the base realignment, known as BRAC. And as long as the banks keep lending developers money, there shouldn’t be a shortage in the future, said Brady Rufenacht, a home builder with Watermark Homes and president of the Fayetteville Home Builders Association. Rufenacht gives several reasons for that. First, he said, there’s plenty of available land on which to build. Second, it’s not difficult to obtain permits in North Carolina. Third, home builders here are able to produce quickly. “We could change the face of Fayetteville in a year,” Rufenacht said.